Anthony Field may be fronting one of Seven’s highest rating shows in RSPCA Animal Rescue, but he and his fellow Wiggles have just stitched up a deal with the Nine Network and Nick Jr. channels for a new TV series aimed at pre-schoolers. The Kingdom of Paramithi, a collection of musical stories, will premiere on Nine in November 2008 and on Nick Jr. in December. The series incorporates musical performance, dance, comedy and new characters. 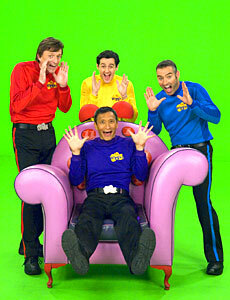 Wiggle and Learn, the troupe’s latest series currently airs on ABC1. The Wiggles, Nine Network and Nick Jr. will combine to present a new pre-school series for Australian families this year: The Kingdom of Paramithi, a collection of musical stories for young children in 30 half-hour instalments. The Kingdom of Paramithi is scheduled to premiere on the Nine Network in November 2008 and on Nickelodeon’s Nick Jr. network in December. Created by Blue Wiggle Anthony Field and Paul Field, written by Paul Field and Paul Paddick and developed with the experience of The Wiggles production team, the series incorporates musical performance, dance, comedy and charismatic new characters. “We are really thrilled about this collaboration,” said Deirdre Brennan, Director of Programming for Nickelodeon Australia. “The Wiggles production team are incredibly experienced in knowing what children want to watch and how best to connect with them. The Wiggles, internationally renowned for entertaining kids in their distinctive blue, green, yellow and red skivvies, are Australia’s favourite pre-school group.